Also know as Marty's Hamburger Stand. Side of Fries and I ventured out to celebrate his retirement, and Marty's has been on deck for some time as a joint that was close enough to our world headquarters for a lunchtime review. We jumped into the helicopter (jet packs were still in the shop), called ahead to get all air and ground traffic cleared, and we set down at Pico and Overland. It was especially nice that the firefighters from the station next to Marty's came out and cheered for us. It was good to be appreciated for all the hard work that we do. We ordered a couple of double cheeseburgers, fries, and drinks. This set us back $18. Yep, 18 bucks at a hamburger stand. We found it especially odd that on the menu they stated the the following: We grind our own meat "Fresh Daily" Hmm.....why did they wrap Fresh Daily in quotation marks? The Beef: The beef was a very average tasting, 80/20 Chuck. 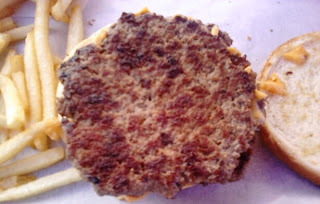 It was a medium grind, and the patties were preformed and separated by waxed paper. They were 1/4 pound each, and the brownish hue to the raw patties suggested that "Fresh Daily" was a euphemism for something less frequent. The beef lacked funk, iron, and blood. It was just barely juicy. It was merely OK. The Sear: They griddled the patties to give them a good sear. While the sear was dark and even, it did lack some crunch. It was merely OK. The Seasoning: The was NO seasoning. That was not OK. The Preparation: At Marty's the burgers were griddled to Well-Done, and that's how I would have requested them anyway upon taking a look at the "Fresh Daily" ground beef. The Cheese: They tossed the American cheese on as an afterthought. 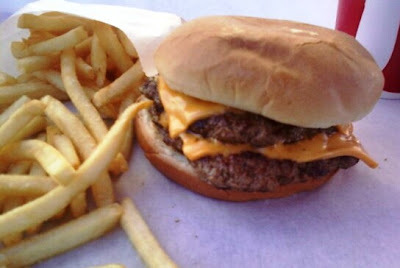 The process of photographing my cheeseburger was what gave the cheese ample time to melt. The cheese did provide some much-needed salt and moisture to the dish. The Bun: The bun was a lightly-toasted, non-seeded, standard hamburger bun. It was a little on the stale side, so the cheese had to work overtime to nearly compensate for the dry bun. The Meat to Bun Ratio: In spite of the dry bun, this was just about right. Had the bun been moist, this would have been just right. The Fries: These came frozen, straight out of a brown, 5 lb, food service bag and tossed into the fryer. Still, they were cooked to a nice crunch, and they were properly seasoned. The Value: Marty's delivered a filling meal, and for 9 bucks a person, it wasn't the worst value that we had encountered. 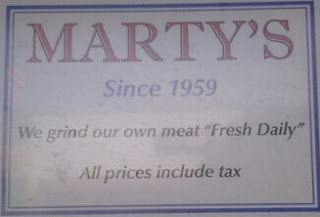 The value was OK.
Marty's was exactly what one might expect of a hamburger stand. It was OK. It was not the sort of thing that we would eat twice, but it was just fine. 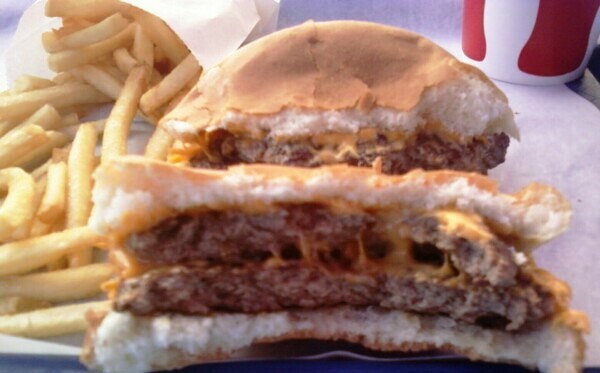 Burger Review : OK...and a FAR better choice than Apple Pan.